You will find my favorite recipe for buttermilk biscuits at the end of the page. Buttery and tender, these biscuits will melt in your mouth. The key to perfect biscuits is the dough must be handled very little. Make sure all of your ingredients are very cold; the food processor works the best for this. You may freeze the rounds on a cookie sheet for up to 1 month. 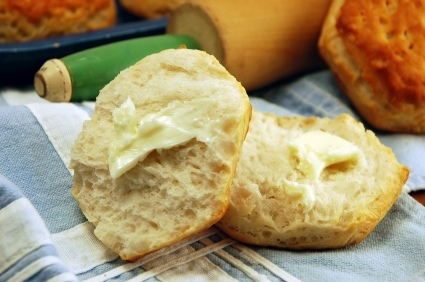 To bake - just place frozen biscuit dough a preheated 450 degree oven and bake for 20 minutes. Another one of my "made from scratch" homemade biscuit recipes. Preheat oven to 450 degrees; you will need a cookie sheet for this recipe. Add the buttermilk JUST UNTIL IT'S COMBINED. (Important) If it is a little too dry, add more buttermilk. Turn the dough onto a floured counter top. GENTLY PAT until the dough is 1/2" thick. (NO ROLLING PIN) Use a round cutter or a glass to form the biscuits. Place on a cookie sheet. (If you like soft biscuits - have the biscuits touching; if you like crusty sides - place them about 1" apart. They will not be as high if you do the latter.) Bake for 10-12 minutes, or until the biscuits are a beautiful LIGHT golden brown; do not over bake. Place the vinegar or lemon juice in a (one cup) measuring cup and then fill with milk. Let it sit for 15 minutes and it’s ready to go.